Egg cookery can be intimidating. The perfect fried egg with completely cooked but silky whites and totally runny yolks. Beautifully round poached eggs with no craggy whites dangling off. Fluffy, barely golden omelets with a creamy yet adequately cooked center. Eggs can be a real trip. But they don’t have to be. Frittatas are your friend. 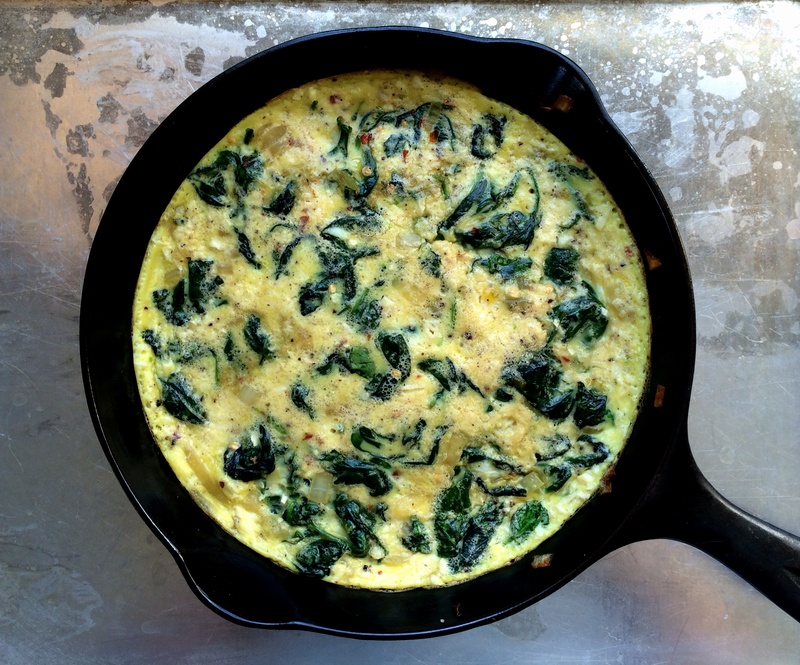 They’re the lazy (ahem…impatient) cook’s omelet. They’re easy, they don’t require careful flipping or folding or just-simmering water, it’s easy to tell when the eggs are fully cooked, and you can do it all in one pan — that’s the kind of cooking I love. 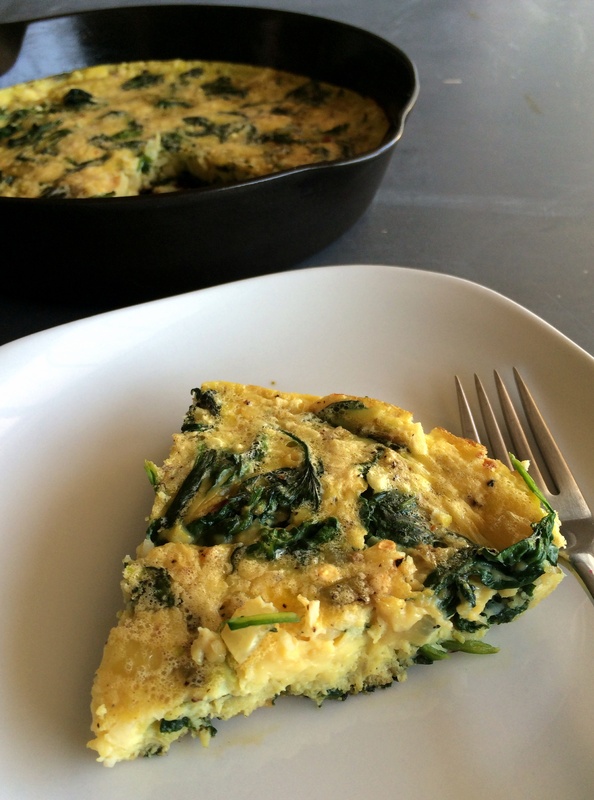 Frittatas allow you to use up any veggie you have on hand. Just saute the veggies in a little oil, season them however you please (a little salt and pepper are just fine), and once they’re cooked pour in the whisked eggs. Continue cooking on the stove until the eggs are set around the edges, then pop the whole thing into the oven to finish cooking through. You can tell the eggs are fully cooked when the top is set (but not browned) and they don’t jiggle; when you slice into it it will be firm and not runny at all. 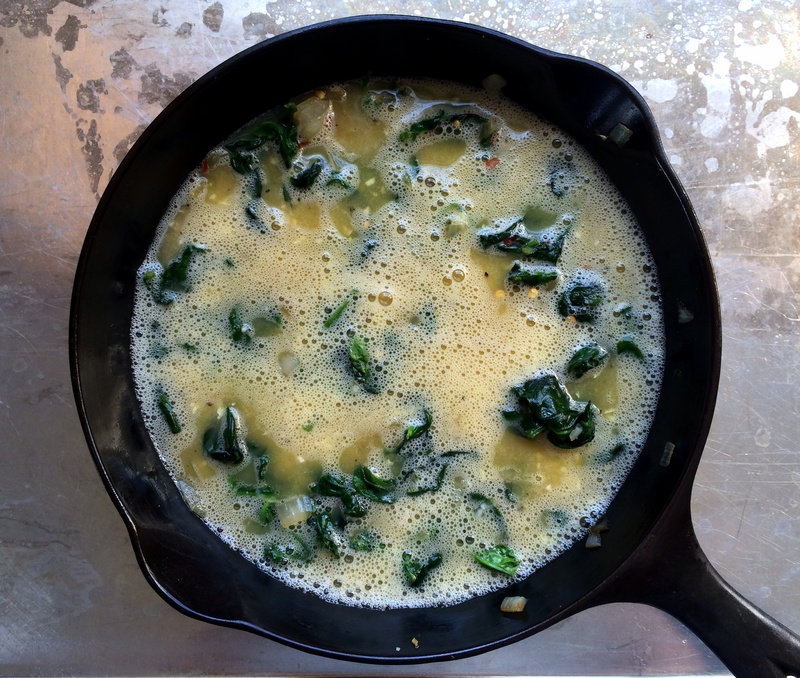 This is a great way to cook eggs for several people…serve it right from the pan at the table. Enjoy! Preheat oven to 375 degrees. Heat oil in a 10-inch cast iron or nonstick skillet (with a heat-proof handle) over medium heat. Add onions and saute until translucent, then add garlic, red pepper flakes and a pinch of salt; cook for one more minute. 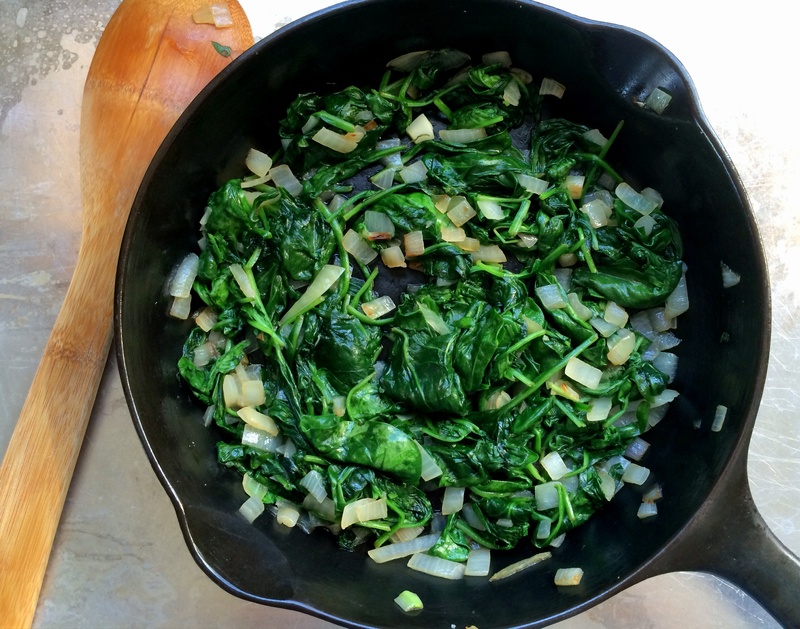 Add spinach and cook until just wilted; you may need to add the spinach a couple handfuls at a time if it doesn’t all fit in at once. Sprinkle with another pinch of salt and stir to combine. 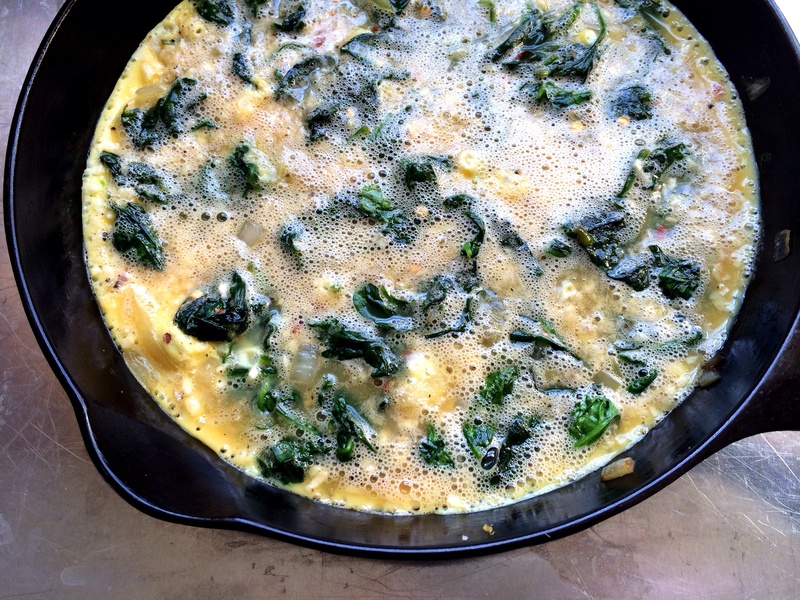 Break eggs into a separate bowl, add a pinch of salt and pepper and whisk (seasoning at each step builds flavor, but also draws out the water from the veggies so it cooks off and doesn’t leave you with a watery frittata). 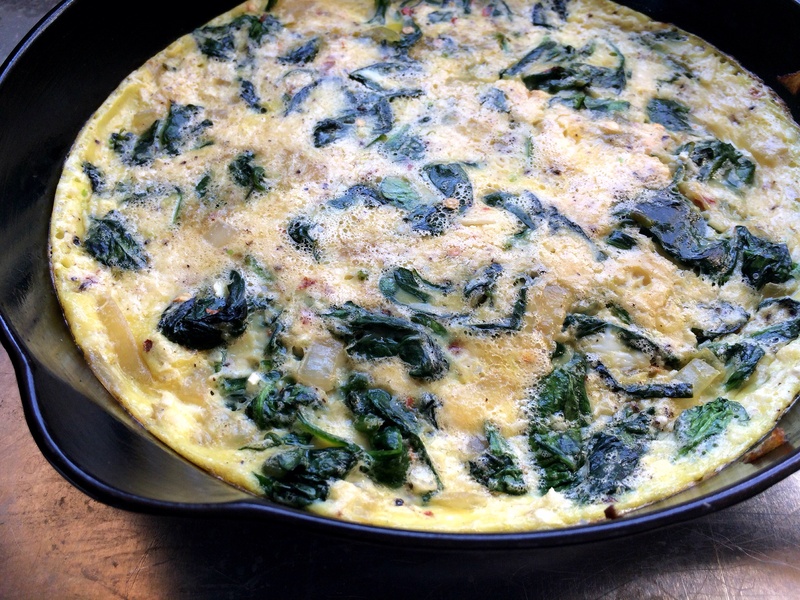 Pour in the eggs and cook until set around the edges, then pop in the oven until eggs are cooked through. 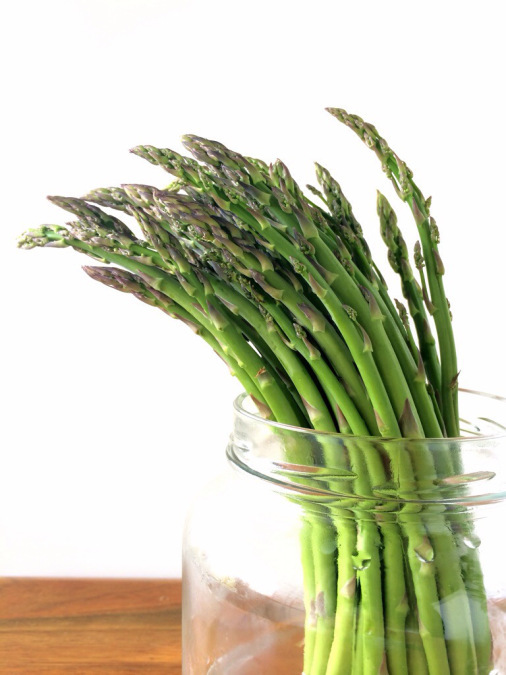 Remove from oven, let cool for a few minutes, then slice and serve. Enjoy!